[CLOSED] LAMY AL-STAR CHARGED GREEN GIVEAWAY! Appelboom, one of the great sponsors of this blog, hooked us up with a great prize: A brand new LAMY Al-Star Charged Green fountain pen! (Fine nib) If you want a chance to win, there are two ways to enter: Either leave a comment on this page, or like and repost this giveaway picture on Instagram. If you want to double the chances, you can enter both ways, but you can't do either option twice (Full terms and conditions can be found below). The giveaway ends within two weeks, Sunday 6th of March at 12:00 AM (GMT+1). OPEN WORLDWIDE! Good luck everyone! 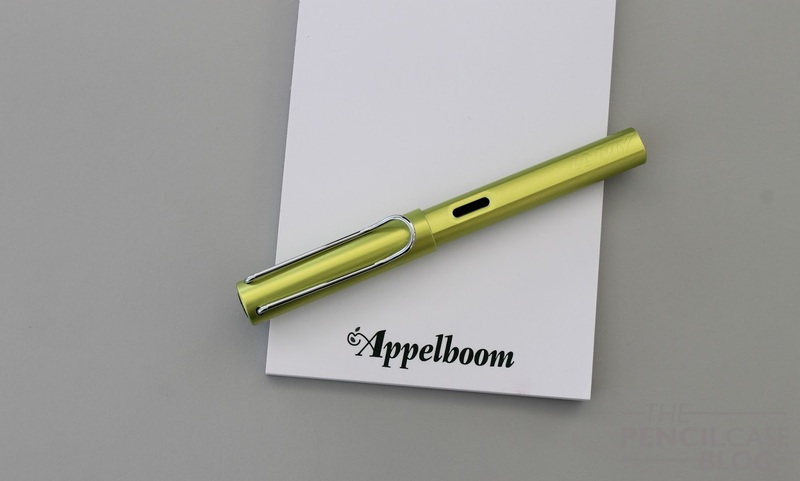 Big Thanks again to the awesome people over at Appelboom! The competition starts 20-02-2016 and ends 6-03-2016 12:00AM (GMT+1). The winner will be announced after the contest closes, and will be contacted trough E-mail. The winner is chosen at random, all entries will be arranged in one list, and random.org will choose the winning entry. Make sure your entry is valid, invalid entries are denied! (Play fair please!) A maximum of one comment and one repost per contestant are allowed. Great pen the Al-Star, and this colour is perfect for my daughter. Thank you for the giveaway. I have not entered the world of fountain pens yet. I have read lots of articles on them and this one seems to be very popular. Thanks for the opportunity to win. I love all the Al Star colors. Would love to add this one. "A nice comment". Well you said to leave that ;). Would love a compagnion for my Vista! I'm electrified to see that beauty 🔋 😂 Thank you for the opportunity and I wish you a nice day! I enjoy my Safari and would love to add an Al-Star to my collection. Thanks for the generous giveaway. Al-star is one of my favorite pens to carry around. No need to worry about it getting beat up and it writes consistently well! Great prize, can never beat a good quality pen. Excellent colour as well. I love Lamys and that color is awesome! Thanks for a great giveaway. Looking good! Thanks for the giveaway Dries! I have a safari and love it, so I imagine a Al-star would be just as great and the color is so pretty! I have a Lamy Vista, but I've always wanted an Al-Star, too! The Al-Star is a wonderful daily carry for any wordsmith! Would love to add this to the collection. Love Lamy pens. Thanks for the chance to win! Thanks for the giveaway! Always nice to add a new pen to the collection! Wonderful pen. And how nice of you to make this a world wide gift! Thank you especially for that. Love that color! Thanks for the opportunity. It's a nice looking pen, but on the picture the orange one looks even better. Always love lamy, definitely want to add an al star to my collection. Thanks for the giveaway. Thanks for sharing this passion through all of us. We are a fantastic family. #enjoy! Pens are seriously one of my favorite materialistic objects in my life. I do not own many because I have certain favorite pens that I prefer, but are not easy to find and obtain due to their expensiveness. It is a small chance that I would win, but I will still enter because that is a really magnificent pen I would love to own, take care of just like my other pens, and be sure to use it for my school classes that only allow you to use pens. Thank you for the great give away and chance to win this lovely and well pointed pen. That color is gorgeous. Thanks for this cool giveaway! Love the look of this - thanks for the opportunity to (maybe) win one! Wow great new colour! Thanks for the giveaway! that colour is fabulous. will be a great companion to my charcoal grey Lamy. I really like the design and the color! Very excited to be considered for this challenge (: happy writing, all! 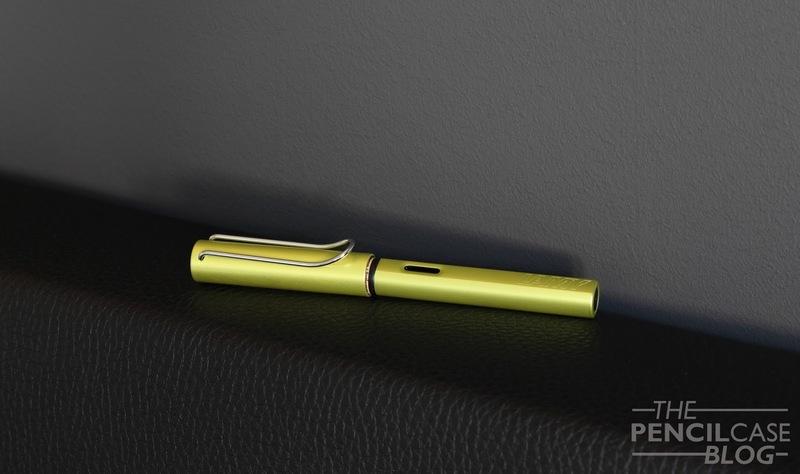 I've never wanted a Lamy so much. Love this color!!! Thanks for doing this! Thanks for running the giveaway. I'm in! What a beautiful new Lamy! I promise I'll give you a good home! Thank you for the chance to win an awesome pen. This will be my fourth LE Al-Star if I win. These pens are great EDC writers. Thank you for the giveaway! Love the colour. Thx for the pen !!! Thanks for the giveaway. This would be my first Lamy pen. Cool color. I just re-entered the fountain pen world with a Metropolitan but I have been eying these All Stars for a while now. Thanks for the chance (and double chance + IG) to win this GAW!